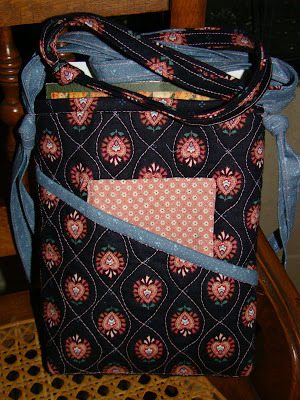 I just finished the 2nd of these cute bags. I made the first for my son's mother -in-law who also quilts, last Christmas. They are the perfect size for a paperback book (in my case, my Kindle) and some hand sewing. The small pocket is for your phone or iPod but for me it will be where I put my room key on a cruise. The pattern comes from Terry Atkinson, atkinsondesigns.com, Elk River, MN. 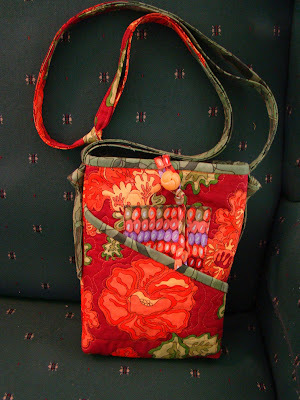 It only takes 3 fat quarters and has an optional zipper closure. Love the tote bag Janet..
Looks a perfect size to take anywhere.. The outside pocket is a great idea. Cute tote, not big enough for all my important stuff LOL.